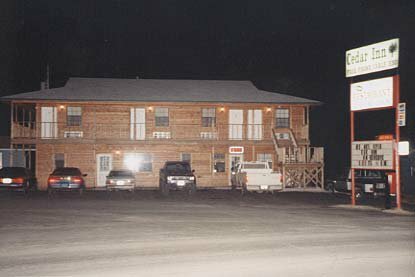 The Cedar Inn is an American-owned and operated motel in Fort Gibson. Each room comes with queen-sized beds, cable TV, high speed internet, free local calls and small refrigerators and microwaves. The motel also has a water softener and filter system. Weekly and monthly rates are available. From Muskogee, take Hwy 62 E then Hwy 62 Business, turn left at Conoco Station (Cherokee Casino), go 3 miles to the town of Ft. Gibson. Located on the right side as you enter town.